Most nights are spent at campgrounds or RV parks with access to shore power – It is cheaper and easier to use shore power from the electrical hookups at these parks and bad weather if not a factor. Touring trips with lots of daily driving – It is multiples more efficient to charge your home batteries from the RV’s alternator during daily driving than from a small solar system (math included later). Dry camping without hookups (Boondocking) – For trips like this that last for more than three days and are not near grid hook-ups, solar panels can be a great way to keep the systems running without any fuel requirements and generator noise. Remote fishing or hunting trips – Most of the best fishing and hunting spots are far away from grid hook-ups so solar panels can be a great option to a loud generator and extend a trip a few days. 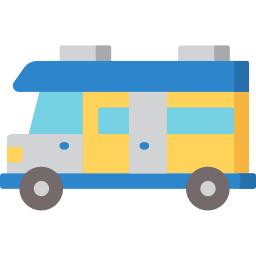 Events or festivals – NASCAR or events such as music festivals have lots of RVs backed closely together and generator fumes often go right into your neighbors area, so solar panels can help you save the fuel and make more friends at the same time! 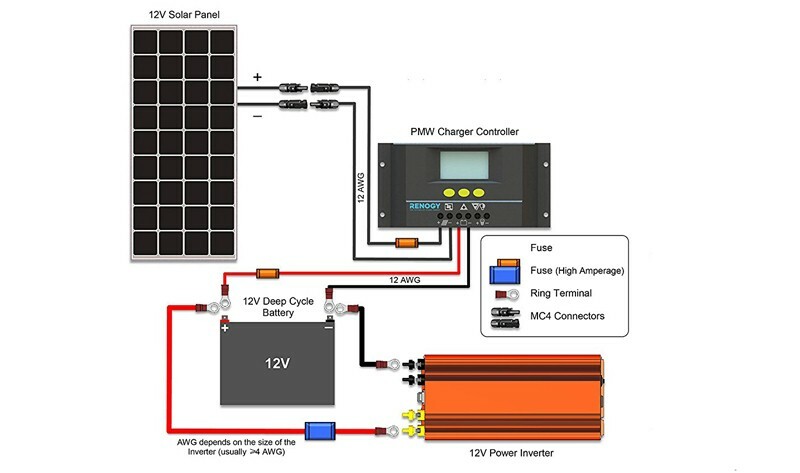 If you fall into one of these uses cases and are evaluating solar panels, our guide will help you understand how to size your system (calculating your energy requirements and system production), pick between the types of solar panels, understand all system components and integration with your RV’s power system and install the system. Our guide is based on 20+ hours of customer research, our team’s experience in the field with these products and other industry reviews. A 120 Volt AC Coach System – Most hooks-ups at a campground will be 120 Volt AC and this supplies power to larger appliances such as the microwave, roof air conditioner or refrigeration (in electric mode). While you are plugged in, a portion of the 120V power will also run through an inverter (to covert AC to DC power) and charge the 12V DC battery (also called a house battery) and run the DC appliances. A 12 Volt DC Coach System – The 12v DC system is used to power most everything else including the overhead lights, the furnace fan, the water pump, and the radio. If you are not plugged in to a power outlet, these appliances will run off a 12V deep cycle battery. A 12 Volt Automotive System – This includes the engine battery (starter battery) and is used to start and run the engine. The engine battery is charged from the alternator. These power systems can receive power from four different sources if you have solar panels: (1) the solar panels, (2) the alternator (if you are driving), which takes power from the engine to charge the engine battery, (3) a generator, or (4) an outlet. The 12V house battery is the central unit for all of these sources, as it is the only one that can consistently provide power. There are four basic components to a solar system: Solar panels, solar charge controller, an inverter and a battery. Your RV already has an inverter, so we will focus on the other three components. It is important to understand the function of each, as you will likely not need to purchase all of these. Our product reviews in the guide is focused on the solar panels, but there are also several kits (WindyNation or Renogy) that package some of these components together (note: it is typically cheaper to buy the individual components separately). Solar panel costs have dropped by nearly 60% in the last decade and the quality and efficiency has also increased. It is rare to have solar panels malfunction, but there are a few features and types of panels that you should take into account when adding solar panels to your RV. Standard or Flexible – We reviewed both standard (fixed) and flexible solar options, which are a relatively new product. Standard solar panels come with and aluminum or other model backing that can withstand strong wind and rain. Flexible solar panels work well if your RV lacks a large enough flat space (they work well with the curvatures of Airstream-style campers specifically or marine applications) and do not require drilling holes. Most folks choose standard solar panels as they are more durable, less expensive and come with warranties. Monocrystalline or Polycrystalline – Monocrystalline panels use a purer type of silicon that makes them more efficient. More efficient means the same level of power output (100W panel for example) with less space, so if you are space constrained, you may want to consider monocrystalline panels. 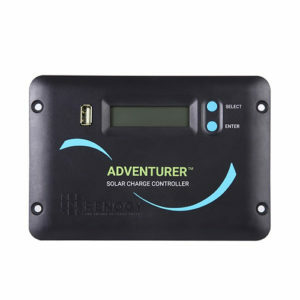 Solar panels can generate varying levels of amps and volts, while a battery is typically 12Vs, so a solar charge controller will regulate the amps and volts that go into your battery so that it does not overcharge. There are two types of solar charge controllers, (1) PWM (pulse width modulation) and (2) MPPT (maximum power point tracking). MPPT controllers are more efficient than PWMs and can improve solar panel performance by 30% by allowing them to operate at optimal power output voltage (as the name implies). PWMs reduce the efficiency of one part of the system to make it cooperate with another part, so are less efficient than an MPPT. MPPT controllers are more expensive though and most choose a PWM (except for unique situations such as extreme cold). The house battery in your RV is a deep cycle battery (vs. a starter battery for the engine. 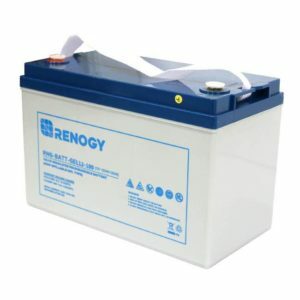 Deep cycle batteries are are designed to be deeply discharged and recharged repeatedly and the most common type is a flooded lead acid (lithium ion batteries are becoming more common but are very pricey). There are also two types of flooded lead acid batteries – AGM (absorbed glass matt) and gel cell batteries. For a more detailed discussion on battery types read the KOA guide. Note: To extend the life of the battery, batteries should not be discharged below 50%. This is an important data point when determining your solar system size and battery requirements. Estimating your energy requirements and system production can be difficult and it is even harder to use that information in determining system component requirements. We will try to simplify the math and uses some general rules of thumb. Solar panels are rated in watts and watts are a function of amps and volts (watts = amps x volts). To use a water analogy, the amps is the width of the pipe and the volts is the water pressure. 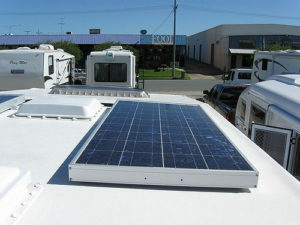 For RV solar panels that charge our 12V house batteries, we are most concerned with the amps that our solar panels are producing and how many panels will be needed to charge our batteries over a day. Batteries are measured in amp hours and a typical 12V battery is 100amp hours. If a solar panel is rated 100 Watts and is charging a 12V battery, it will produce 8.33 amps (100/12 = 8.33) and if you have a 100 amp hour battery that is 50% discharged (50 amp hours), it will take that solar panel approximately 6 hours to charge the battery to 100% (50/8.33). 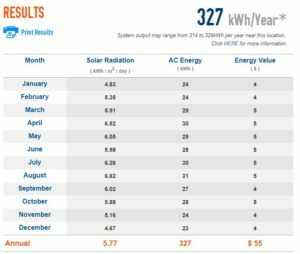 You can estimate your total electricity usage by looking at your appliance ratings, estimating the power requirements (in watt hours) for each and tallying them up. For a simple example, if I have a 60W light bulb and have it on for 4 hours, that would be 240 watt hours (60 x 4). But you likely do not have even an accurate ballpark estimate of how many appliances you use and there is an alternative approach that is much easier. The next time you go camping in your RV, start with a full battery and measure how much of the battery you drain over a few days (most RVs will have a voltage meter and you can use this to determine how much the battery has discharged using as a State of Charge). As an example, if you have a 100 amp hour battery bank that in two days goes from 100% to 60%, your daily usage (20%) is 20 amp hours and this is what you would need your solar panels to produce. Solar panels are rated in watts and the watts are based on ideal operating conditions (70 degrees and full sun – solar panels are less efficient when it is really warm), which you are unlikely to experience on a typical RV trip. To make the math easier, lets assume that we can operate at the full 100W and that we get 4 hours of “ideal conditions” a day, which would be 400 watt hours (4 hours of sunlight x 100W) and to convert that to amps we take 400 watt hours / 12V = 33 amp hours. The daily system production will vary based on the time of the year and location, but a good general rule is that a 100W panel will generate ~30 amp hours a day. If you want to check system production estimates of a system based on your location, use the National Renewable Energy Lab’s PVWatts calculator (it is very easy to use). As an example, we input a 200W system in our location (San Diego) and PVWAtts estimated that the annual production was 327kWh per year (or divided by 365 is ~900 watts per day). The 900 watts per day is equal to 4.5 hours of full system production (compared to 4.0 in our estimates) or 37.5 amp hours per 100W panel (900/2 panels/400) which is very close to our general rule of thumb of 30 amp hours per 100W panel (San Diego is sunnier than most locations). To summarize the system sizing math, if you estimate that you use ~60amp hours a day, you would need 2 (60/30) 100W panels to replenish your battery every day. There are many RV solar panel installation videos on Youtube and we found the one below (which is start to finish) to be the most helpful. Before buying solar panels for your RV, make sure it makes sense based on your travel style. If you mainly stay at campground and RV parks and drive daily, solar panels are likely unnecessary. Run a few days on the battery to get a good estimate of your daily usage (in amp hours) and then use the general rule of 30 amp hours per day per 100W panel to determine how many panels you need (no further analysis required). The best way to serve on energy costs is to reduce your demand, so before going solar, consider reducing your demand through appliance or lighting efficiency upgrades. The Suaoki 100 Watt 12V Flexible Solar Panel is made with SunPower solar cells, which make the highest quality solar panels in the world. The SunPower panels have a higher-than-average 23% to 25% solar efficiency and an internal blocking diode which prevents reverse current drain at night. The Suaoki panels are semi-flexible solar panel, which makes them ideal solar panels for the roof curvatures of an Airstream-style RV. The panels can be flexed to a curve of 30 degrees max. The panels are also lightweight at less than 5lbs or 80% lighter than comparable fixed models. The flexible design includes four metal reinforced mounting holes at each corner for fixing screws for an easy installation. The ALLPOWERS solar panel is made with high conversion efficiency modules made by Sunpower. The panels have a max curvature of 30 degrees and can be mounted on irregular surfaces. The panels come with an 18 month guarantee. The HQST 100 Watt 12V Solar Panel is made with high conversion efficiency modules and sturdy materials. The panels are made with anti-reflective, high transparency, low iron-tempered glass with enhanced stiffness and impact resistance that can withstand high winds (2400 Pa) and snow loads (5400 Pa). The panels come with pre-drilled holes on the back of the panel allow for fast mounting and securing. The panels can be used with different mounting systems including Z-brackets, Pole Mounts, and Tilt Mounts. The panels are backed with a corrosion-resistant aluminum frame for extended outdoor use, allowing the panels to last for decades. The panels come with 5 years material and workmanship warranty and 25 years power output warranty. Heavier than flexible solar models at nearly 20lbs. The Renogy 100 Watt 12V Solar Panel is made with high conversion efficiency modules and strong materials. The panels come with pre-drilled holes on the back of the panel allow for fast mounting and securing. The panels come with 5 years material and workmanship warranty and 25 years power output warranty.